Interestingly, this classic debuted in 1981. As did I, at least from a professional perspective. That was a long time ago, and I never really examined the idea of “how did I get here” until I started to rethink my presentation at Clicktale’s 2018 kickoff, as I discussed here. As I began to churn through my career arc as the basis of the idea I wanted to get across to our team and the root of my desire to lead my company towards aspiring to great, not just settling for good, I realized that there were a lot of moments along my path that led me to the philosophies I hold regarding our market, but really about technology marketing in general. I want to start addressing those here, in the context of a career that began in 1981, 37 years ago. In fact, I realized when presenting that a significant majority of the folks I was presenting to weren’t even born in 1981. Others were kids worried about their little league games and Barbie collections. A few (a really small minority, such is the reality of the industry) were just a few years behind me on the journey. As far as I know, only our CEO was older than me in that room. What I wanted to help people understand is what I believe the central tenet of good marketing is – articulating the “so what?”. I apply that phrase as a prism around everything we do. Whenever I hear of a new feature, I say “So what?”. A new market opportunity? “So what?”. A new competitor? “So what?”. It’s really the simplest way (in my opinion) to categorize and differentiate. If you don’t have a “So what?”, your product or value proposition is probably going to fail. If you have one, but you can’t articulate it, you personally are likely to fail. It’s a fairly simple equation. So simple that most people don’t really view it as such a fundamental principal. I am going to touch on how I came to understand “So what?” in my own career, and how that simple principal has led me to this point. I want to articulate why I think it is the key going forward. I also want to always maintain the context of why I am writing about my history, so it isn’t just a biography that nobody outside my family really cares about. 1981. I’ll start there, but a little background is important. I didn’t graduate from college. My family couldn’t really afford for me to go, and I kind of hated school all along. I didn’t know what I wanted to do with my life anyways, aside from really wanting to be a professional baseball player. Let’s just say that idea was flawed. I worked a retail job for a few years in my late teens, and then got a job working in a warehouse picking industrial products (screws, bolts, tools, etc.) and packing them to ship out. We lived in Silicon Valley, but back then the Silicon part was more real than it is today – the technology industry was largely making chips and components. There weren’t many personal computers yet, and the chips built were largely for mainframes and minicomputers and terminals to access them. There wasn’t any inkling of a software industry, beyond IBM and Digital Equipment Company, building programs for those mainframes and minis, none of which was really done in Silicon Valley. Yet. None of which I even knew existed. IBM was a typewriter company to me. Long story, but I met a girl and we eventually got engaged – and I realized that working in a warehouse probably wasn’t the best long term life strategy and began to look for a “real” job. The idea of a career was far-fetched. I was 20 years old, with a high school education. I decided to look for a better job, using the most sophisticated tools of the day: classified ads in the local newspaper. My skillset was pretty limited. I started at A: Accounting. Nope. Assembly? Maybe. So on, and so forth. At some point, I got to M. Marketing. I read a few job descriptions, because I literally had no idea what marketing was. The descriptions were pretty simple and undefined, giving my 20-year old brain the idea that the job was pretty simple and undefined. I answered a few ads by typing up resumes (actually, in truth, I had my mom type them – she was an executive secretary and typed at warp speed), putting them in envelopes and mailing them to the companies from the ads. Because that’s how it was done back then. For whatever reason, I got a call from one of the resumes. The call was from a company named SoftLink. They made software. Whatever that was. This building in Santa Clara California was SoftLink’s headquarters in 1981. As you can see, the entire business park is being torn down and replaced. Remember, in 1981, the Apple II had been out for a couple years, and the IBM PC was announced mid-year. Radio Shack’s TRS-80 was actually the leader (more on Radio Shack in a future post). I seriously didn’t know what software was. Nobody really knew what software was. My computer experience was playing Pong. Turns out I got the call because this marketing job had two parts. The second part I was actually qualified for – putting the software into a box and shipping it out the door using UPS. My warehouse experience to the rescue! The first part, actually marketing something, was a complete unknown to me. Luckily, it was also a complete unknown to anybody else, too. The industry was too nascent for anybody to know what they were doing. My job was essentially this: There was a list of about 50 computer stores in the U.S. That was the entire universe of those stores back then, with most of them focused on hobbyists building simple computers. I had the list and I had to call them one by one (email didn’t exist) and ask them if they would stock our software. 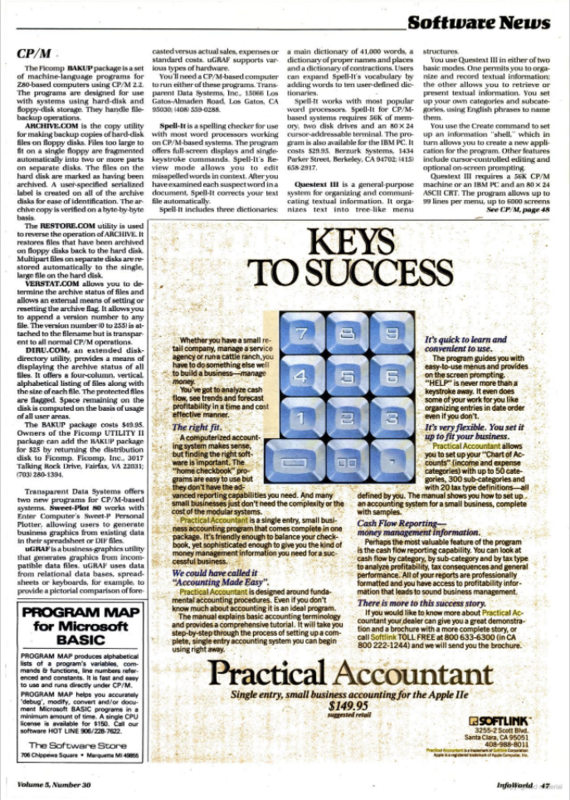 In that period, the first “killer app” that came out was the spreadsheet – and the big player was VisiCalc. The other big thing was word processing, and WordPerfect was the big name. Each probably had maybe a couple thousand users. SoftLink, unfortunately, didn’t create either of those. SoftLink had two similar (but less known) products that we resold, SuperCalc and WordStar, licensed from their creators. These both came on 8″ floppy disks, each of which had about 240KB of storage capacity. Our thing was that we had a way for a user to try a limited “demo” version before unlocking the disk and getting the full value. So, a store could sell a $49.95 locked version, and the user could unlock it later, paying for a code over the phone. I just had to get the store to stock it. 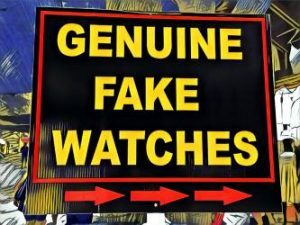 We didn’t even charge them, we asked them to stock it, and if they sold it, send us the proceeds, minus their 30% margin. Simple, right? Wrong! I’d call a store and ask them to stock our stuff, for free. They’d ask why it was better. I’d then stammer a bunch, and finally hang up. Because I had no idea. None. I didn’t even know what they were supposed to be used for. So, I had to learn. What was CP/M? (the dominant operating system before MS-DOS), what was “what if” analysis? (the thing spreadsheets started out being used for). Worse, I had to answer a hard question: why should they sell a locked demo version of the lesser products for $49.95 instead of an unlocked version of the leading products for $125.00 and make more money? Software public relations hit, circa 1982. I had no idea. I didn’t have a “So what?”. And I didn’t have anywhere to get one from, not even anybody I could copy. So, I created it myself. By being inquisitive. Learning how spreadsheets and word processors were used, and by who. Why they were better than ledgers and typewriters (seriously). How to position (even though I didn’t know what that meant) the reason to stock our locked thing instead of the other guy’s unlocked one. I figured it out. I had to. This was also my first exposure to a brilliant idea, simply just ahead of its time. This was when I first realized that there were people thinking about where the puck was going, not where it was. In this case, unfortunately, 30 years ahead of when the puck would arrive. Think about how much software is distributed today in a similar fashion! The problem for SoftLink was that there wasn’t an Internet or an App store to distribute through – we had to work with a very limited number of dealers, and “sell” one box at a time. 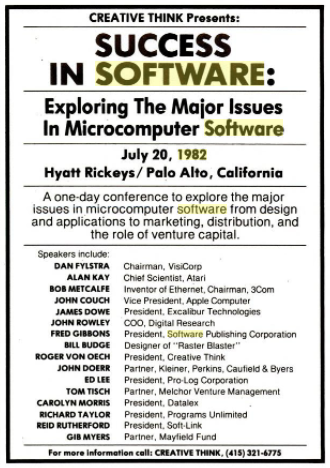 One of the first software conferences. Look at who some of the speakers were, including Reid Rutherford of SoftLink. Later, we also wrote our own product – a small business accounting tool (think QuickBooks, which also debuted around the same time) called Practical Accountant. Practical Accountant was only for the Apple IIe. Of course, it came out after the IBM PC had debuted, rapidly becoming the dominant microcomputer (sense a pattern here?). The job was essentially the same. Call stores to get it on the shelves. The new idea was to create a simple data sheet to send the stores with details about it, and even to create and place a few magazine ads. I was also the guy who answered the calls when and if they came in. Not many did. My first ad. InfoWorld. July 5, 1983. If someone said yes, I would go to a computer, take the master floppy and put it into one disk drive, and format a blank one in the other drive and copy from master to target. Throw a handmade label on the disk, put it in a box, and ship it. Sometimes, if I was lucky, the store would ask for 3 copies. This was the early definition of “marketing operations”. There was no concept of demand generation, of positioning or value proposition, or even differentiation (often the difference was simply that our stuff happened to run on Apple, which was great, unless the computer store only sold MS-DOS or CP/M computers). No email, no direct mail, no trade shows or events or seminars. No CRM system, not even a spreadsheet of my own to track who I’d called (I didn’t even have a computer on my desk to use myself). Websites? didn’t exist for 10+ years. Social Media? Another 15+. Very little PR, just with a few print magazines, such as PC Magazine and InfoWorld. That was my world. That’s how I started this journey. I literally (starting at 20 years old, with zero experience), was able to define what marketing meant for a software company. And I’ve never stopped learning, and have been succesful enough to keep defining that for other companies along the way. This was also the beginning of my higher education, but out in the real world. The good news? I couldn’t have learned most of what I did in any school, because there wasn’t anybody to teach me, yet. Figuratively, I was learning to skate. To stand upright and move my feet, and to let go of the boards on the side of the rink; and learning how to do so fearlessly, because good marketing is by its very nature provocative. I was forced to be inquisitive, and to absorb what things did, and what problems they solved, and I had to evangelize that, one storekeeper at a time. My “So what” journey had begun. I figured out that learning something relateable and storytelling about it – to the right person, at the right time – and always infusing it with “So what” – worked. In Part 4, I’ll cover the next phase of the journey, where I met some people who changed my life, and framed my perspectives on so many things, including learning about why “playing where the puck is going, not where it is” is so important to me. Very interesting to someone on a completely different path (nursing) and very informative. Looking to 4!